What does peace mean for students in Moldova? These and other responses amazed me with their authenticity and integrity. We included many of them in our video, which we produced with Romanian subtitles for our community. 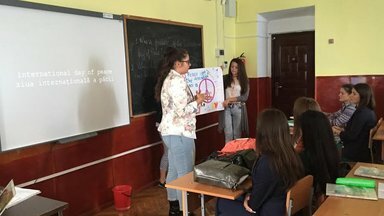 The International Day of Peace occurs every September 21, three weeks after the school year starts here in Moldova. For many Peace Corps Volunteer teachers, it provides a unique opportunity to celebrate international peace and discuss its significance with our schools, organizations, families and communities. Presentation about International Peace Day. We presented our short video video along with projects and posters to the school community and administrative staff on the International Day of Peace. I also took this opportunity to introduce myself and explain the history of Peace Corps Moldova to my students and colleagues. We ended the day outside in front of the school. 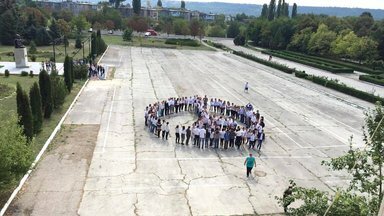 With the help of a very welcoming and active Romanian teacher, we planned to form a human peace sign and take photos from the top third floor of our school building. What occurred when the students arrived outside, however, was nothing short of amazing. Students formed a peace sign for the 2016 International Day of Peace. The students had decided together to all wear white shirts. Each contributed 3 Moldovan lei, or approximately 15 cents, to rent a drone camera to film our human peace sign from above. I had no idea they were planning this. The video footage of our activities was spectacular. It made Moldova’s national news and sparked a renewed sense of confidence and positivity among the students. When the International Day of Peace approached again recently during my second year, I knew we’d have to be just as impactful. This time I was joined by a new PCV who came to work in our town’s mayor’s office and library through Peace Corps Moldova’s community and organizational development program. We decided this would be a perfect opportunity to collaborate across our two programs. Instead of using a peace sign, we’d spell out the words “Peace” in English and “Pace” in Romanian, with the students forming a flash mob. Once again they dressed in white and were motivated and excited to honor this important day, which we celebrated with a small ceremony on the school steps. Our theme this year was “Peace & Foreign Languages.” By inviting students to speak at the ceremony in Romanian, English and French, we were all reminded that we practice compassion by learning and speaking a foreign language. We understand a new country, a new culture and new people. Once again, my students responded with a level of honesty and enthusiasm that astounded me. Now, as I enter into my last year in Moldova, I look back on September 21st, 2016 and 2017, as two of the most memorable and important days of my Peace Corps service. Both days taught me an important lesson: By showing compassion, listening intently and being patient, we can make every day an International Day of Peace. 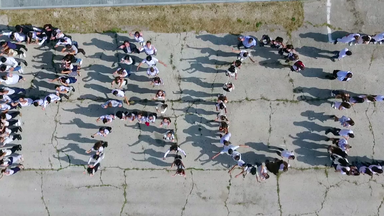 A flash mob of students formed the word Peace in Romanian. Alex Bostian is an English Education Volunteer in Moldova, where he joined the Peace Corps after graduating from Gordon College in Massachusetts. He calls Boston’s North Shore and the Blue Ridge Mountains his homes.